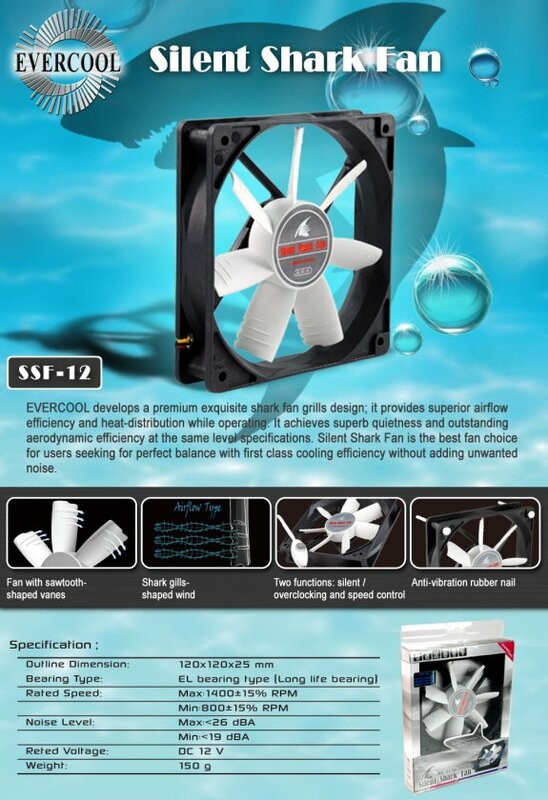 EVERCOOL develops a premium exquisite shark fan grills design; it provides superior airflow efficiency and heat-distribution while operating. It achieves superb quietness and outstanding aerodynamic efficiency at the same level specifications. Silent Shark Fan is the best fan choice for users seeking for perfect balance with first class cooling efficiency without adding unwanted noise. Fan with sawtooth-shaped vanes creates high air pressure and provides great cooling performance. Shark gills-shaped wind guides generate an outstanding vortex airflow. Two functions for silent / overclocking and speed control make it convenient and affordable. Anti-vibration rubber nail design for a quiet operation. Unique Ever Lubricate bearing for long-time use.